The rights, I am Romanian, part of the installation The Rights, as represented in Open Space, Vienna, 2008. Sizes variable, 7 videos, black and white, duration varies between 7 to 10 min, loop. 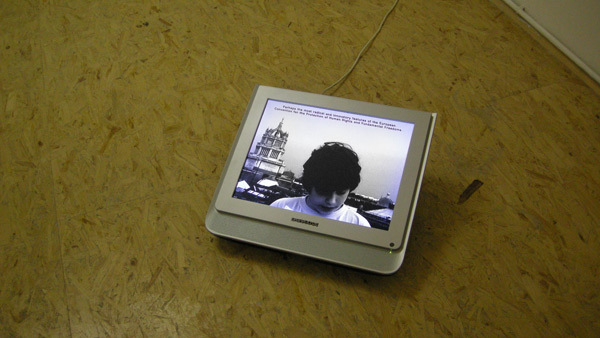 The videos are sometimes represented as a single screen video. Rights, i am Macedonian; Rights, i am Romanian; Rights, I am Bosnian; Rights, I am Serbian rights; Rights, i am Turkish. The Rights is an ongoing series of video recordings of different boys and girls, originating from countries of New Europe. For example – the episode Rights, I am Macedonian, portrays a 9 year old boy of Macedonian origin, reading a description of the European Convention for the Protection of Human Rights and Fundamental Freedom from The Concise Oxford Dictionary of Politics. Similar to this all other children are reading the same text. The complexity of the vocabulary and sentence structure and the boy’s inability to comprehend the concepts contained in the text itself. The attempt to comprehend the text, symbolically speaking reflect the difficulty / near impossibility for immigrants to become integrated into the ‘maze-like’ legal systems of their adoptive western societies. Book: Mapping contemporary creative practice, 2008, ENG/GER, containing essays and images about the yearlly program of Open Space.